It seems a week doesn’t pass where there isn’t a trade story about a newspaper layoffs. Newsrooms today are much smaller than in years past, resulting in less coverage and less of a reason for someone to subscribe. I stopped taking the “Hartford Courant” years ago after several of my favorite reporters/columnists abruptly disappeared in a particularly heavy retrenchment. According to Poynter.org, a study released this week by the University of North Carolina’s School of Media and Journalism revealed that about 1,300 U.S. communities have now totally lost news coverage. Citizens live in news deserts where there’s no news organization serving as watchdog. Being a news junkie, I routinely check out as many as 10 newspapers a day and probably 20 more occasionally – online. Add in national/international news organizations, including AP and Reuters, as well as more partisan news websites and my total daily consumption possibly exceeds three dozen regular sources. I also get alerts on my iPhone to breaking news from the Washington Post and the Los Angeles Times and I follow several state and regional newspapers on Facebook and Twitter, receiving the headlines but not the full stories. Nonetheless, I still feel less informed by newspapers than I did a decade or two ago because of fewer staffers and a smaller news hole (the actual amount of space devoted to news content). Most newspapers now have pay walls. They allow the reading of a very limited number of news stories per month, then insist upon a subscription. A digital subscription can cost anywhere from $8 to $10 a month. No way am I going to purchase subscriptions to more than one or two newspapers. The cost is prohibitive when I may only want to read a story every few days. It shouldn’t have to be that way. As someone who worked there as a columnist during the peak years, it’s depressing. Also depressing is the fact citizens are unwilling to pay for the product. 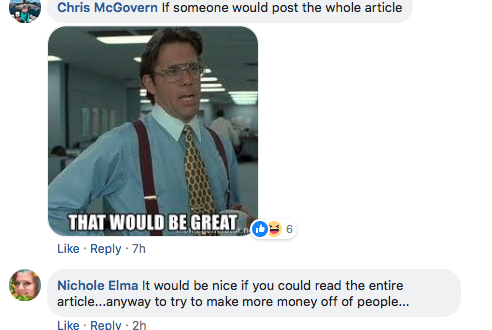 A recent post on Facebook of a link to a story in the “Republican-American” in Waterbury, CT, for whom I currently write, prompted someone to complain (see screen shot at top) that they couldn’t read the story for free. Would this person walk into a restaurant and expect a free burger? It costs beaucoup bucks to produce news content – in print or online – and it cannot be handed out for free. But newspapers are really surrendering dollars by not inventing an easy a la carte payment system. So many folks move around these days, taking with them a curiosity about places they used to live. While I can’t justify online subscriptions to the “Arizona Republic” and the “Columbus Dispatch” in Ohio, where I also used to live, I am willing to pay for individual stories. There are a couple of writers in the “New York Post” that I’d pay for willingly to read regularly, too. Same with the Journal Sentinel in Milwaukee for stories on Harley-Davidson. If all major and regional newspapers charged, say, 25 cents per story, I just might fork over a buck a day. Just make the payment system simple. One click, no matter the newspaper, and that newspaper gets my payment. A quarter might not be much, but multiplied by millions of potential customers and there’s millions to be made. That’s money that newspapers are currently not receiving; money that could make a difference between continued operation and shutting down.